These five sets include every academic vocabulary word needed to teach reading and writing in Grades 3, 4, and 5 under both Common Core standards and TEKS for Texas teachers (with the exception of nonfiction text features). 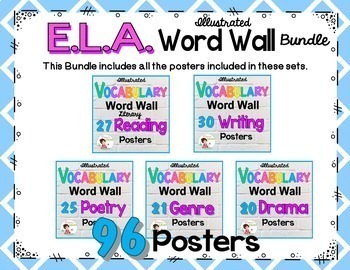 Each vocabulary poster is a full-sized 11 x 8-1/2 inches and includes the vocabulary word in a colorful graphic so it can be seen from anywhere in the classroom. 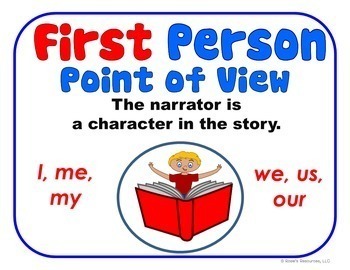 Each poster includes a definition in kid-friendly language or an example. 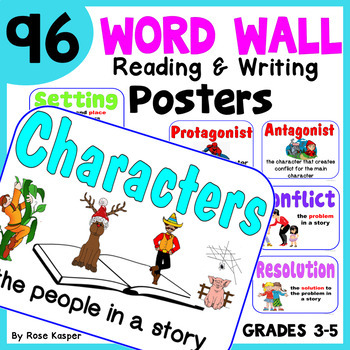 Also included on each poster is a picture of the vocabulary word to help visual learners. Print and laminate all the vocabulary posters. Store them in a file or a large plastic bag. Then, as you introduce new terms throughout the year, simply pull out the poster. Post it on the word wall and refer to it frequently throughout the year to help retain the vocabulary words and their meanings in your students’ long-term memory. These posters are also great to use in small group instruction to reinforce ELA academic vocabulary. Whole Brain teachers will love using these posters as PowerPix. For a smaller version of these posters, use your printer settings to print 4 on a page. Put them on a ring in a learning station or have students glue them into their interactive notebooks. poetry, stanza, rhyme, rhyme pattern, line break, rhythm, meter, meaning and emotion, figurative language, alliteration, onomatopoeia, imagery, simile, metaphor, personification, hyperbole, narrative poetry, lyric poetry, free verse, Haiku, cinquain, concrete poems, limerick, first person point of view, third person point of view, realistic fiction, historical fiction, science fiction, fantasy, folk tale, tall tale, myth, legend, fairy tale, fable, prose, nonfiction, fiction, mystery, literary nonfiction, biography, autobiography, adventure, graphic novel, plot, rising action, falling action, climax, character traits, setting, conflict, resolution, theme, the writing process, planning, drafting, revising, editing, publishing, personal narrative, narrative, expository text, informational text, informative/explanatory text, persuasive writing, opinion writing, procedural text, introduction, conclusion, topic sentence, central idea, elaborate, audience, conventions, drama, cast of characters, setting, dialogue, scene, script, stage directions, text organization, inference, compare and contrast, draw conclusions, main idea, fact, opinion, summary, connections, author’s purpose, visualize, tone. • Look for the green star next to my store logo and click it to become a follower. Voila! You will now be able to view my new publications each time you login to TPT.